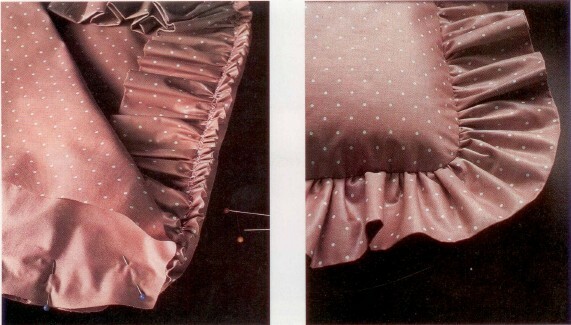 Ruffles add interest to a pillow or enhance needlework pillows.Make ruffles from matching or contrasting fabric, or purchase lace or eyelet ruffling. Cut pillow front and back 1″ (2.5 em) larger than finished pillow. Cut ruffle strips twice the desired width plus I” (2.5 cm) for seam, length two to three times the distance around pillow. Ruffles are usually about 3″ (7.5 em) wide. Decorator fabric for pillow front and back and double ruffle. Purchased ruffling (optional),equal in length to distance around pillow plus 1″ (2.5 cm). Cord, (string, crochet cotton or dental floss) for gathering. 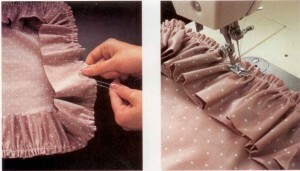 1) Stitch short ends of ruffle strip with 1/2″ (1.3 CM) seam, right sides together, to form a loop. Fold strip in half lengthwise, wrong sides together; fold into fourths. Mark each fold with a 3/8″ (1 cm) clip. 2) Prepare raw edge for gathering by zigzagging over a cord (follow direction here for Ruffled). For square pillows, match clips on ruffles to corners of pillow front, right sides together and raw edges even; for rectangular pillow,match clips to center of sides, right sides together and raw edges even. Pin. 3) Pull up the gathering cord until ruffle fits each side of the pillow front. 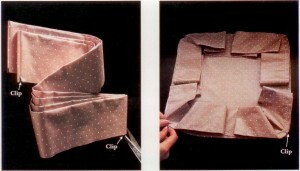 Distribute gathers, allowing extra fullness at corners so ruffle will lie flat in finished pillow. Pin ruffle in place. 4) Machine-baste ruffle to pillow front, stitching just inside gathering row. 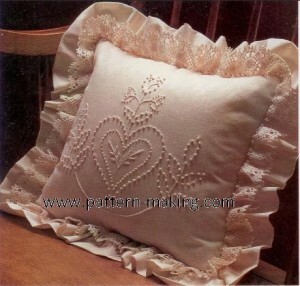 5) Pin pillow back to front, right sides together,with ruffle between pieces. Stitch 1/2″ (1.3 cm) seam, leaving 8″ (20.5 cm) opening on one side for turning. 6) Turn pillow right side out. Insert pillow form or knife-edge liner; slipstitch opening closed.